Petitions for relatives (or future relatives such as a fiance(e) or prospective adopted child) to immigrate to the United States. The Visa process can be tricky and confusing. It’s highly regulated and Attorney Salguero and his staff are very familiar with the constantly changing regulations. Are you or someone you love facing deportation? Our firm can help keep you off of the “Deportation List”. El abogado Omar habló con Univision para discutir qué acciones podrían causar problemas de inmigración a un inmigrante. 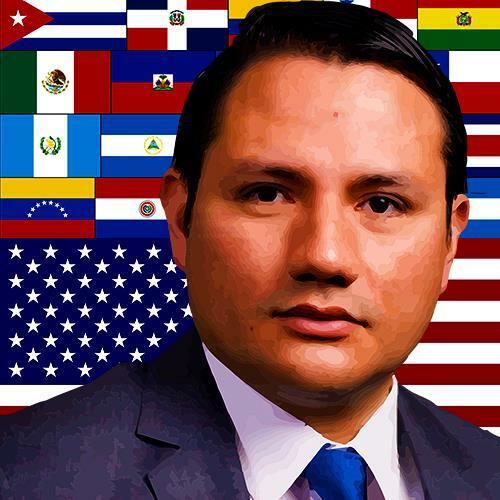 Attorney Omar Salguero practices Immigration law in Northern Illinois. Mr. Salguero is currently of counsel for the Latino Immigration Legal Center in Aurora, Illinois. Worked for a variety of financial institutions in the Chicago land area. Presided over the Latino Law Student Association (LLSA) and served as the Central Regional Director for the National LLSA. Recognized for his leadership and service with the Edward F. Diedrich Award. 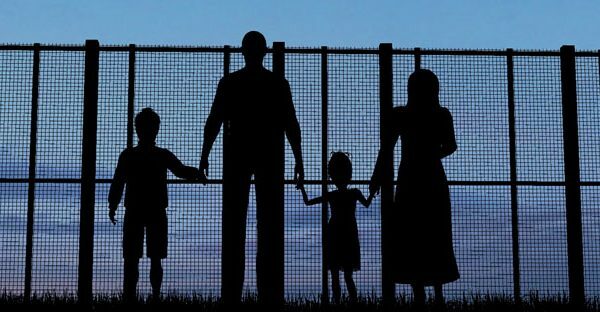 From Immigration, Criminal, Civil & Family Law, Attorney Omar Salguero can provide peace of mind during times of uncertainty. 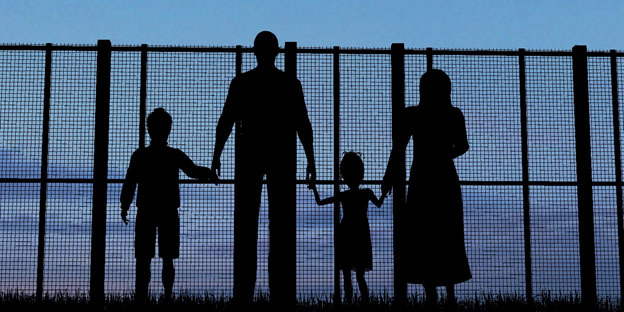 Our firm provides representation in family-based immigrant visas, waivers of inadmissibility, removal/deportation defense, humanitarian relief (e.g. temporary protected status, asylum and deferred action), naturalization/citizenship, nonimmigrant visas (e.g. tourist and religious worker visas), appeals and compliance with the Immigration Reform & Control Act (Form I-9 and anti discrimination). Our entire staff is bilingual in both Spanish and English. Secretary of State hearings- We understand that the loss of driving privileges places an immense strain not only on a driver, but his or her family and their livelihood. A Secretary of State hearing serves to evaluate an individual’s commitment to changing the behavior that caused the revocation of his or her driving privileges. If the revocation of your diving privilege is due to a DUI, you are required to show proof that you have completed or continue to comply with the requirements set forth by your Uniform Report risk evaluation. With a driver’s license reinstatement attorney on your side, you can be wholly prepared for your hearing no matter how complicated the situation. Representing buyers- Our team takes the time to get to know our buyer clients. There is a great deal of legal terminology in real estate negotiations. We understand their questions and concerns pertaining to the detail-oriented requirements of a real estate transaction. Our experienced attorneys look for details that are often overlooked. We advise and guide clients through the process of closing on their coveted real estate investment. 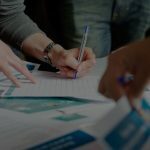 Representing sellers: Most sellers are motivated to move through the sale process as effectively and proficiently as possible so they move to the next stage of their lives. Our representation focuses on detaching sellers from their current situation with as few long-term entanglements as possible. We advise on closings to ensure that our clients are safeguarded during the closing process and in the future. DUI. Driving Under the Influence of Alcohol (DUI) is serious offense in Illinois. Even a first-time DUI offender is faced with significant fines and jail time as well as other severe consequences. An experienced DUI defense attorney can fight to get the evidence surrounding your arrest eliminated or suppressed, reduce the charges, or negotiate an agreement. If you’ve been charged and arrested for DUI contact our experienced attorneys to learn how we can help you protect your rights, fight the charges, and help decrease the chance that you will end up with a DUI conviction on your record. We ensure a commitment to personal service by providing one-on- one communication directly with your lawyer. Divorce. Without a divorce lawyer, it’s difficult to navigate the processes of a family law case in Illinois. When seeking a divorce, whether simple or complex, there are multiple factors to consider. From custody disputes and visitation rights to child support and property distribution, we understand that this life-altering situation can have a ripple effect on every facet of life. If you are considering a divorce, speak with one of our attorneys who will assure efficiency in navigating the process. Child Support. Child custody and parenting decisions are of utmost importance in Illinois. Child support is a monetary payment toward the living expenses of their children by a non-custodial parent. Child support payment is determined by the court that will consider the best interest of the child. Our knowledgeable family lawyers can explain how child support is calculated and help you settle fair, precise terms. Our attorneys have diligently prepared numerous individuals for reinstatement hearings, and are experienced in representing clients at hearings before the Illinois Secretary of State. A real estate transaction is one of the most valuable investments and biggest decisions that individuals and families alike will face in their lives. We ensure a commitment to personal service by providing one-on- one communication directly with your lawyer. During trying family times, a divorce attorney is needed to evaluate legal transactions and child support issues. We are committed to the details of your case. Do you want to start a new business in the U.S.? Do you want to buy an existing business? Do you intend to keep your overseas business in operation? 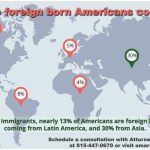 Is your main goal to do business in the U.S. and/or to get a green card? Just like your business goals, your employees are not limited by geography! We provide exceptional support in all non-immigrant visa categories, including employers seeking worker status for a specific time period and purpose. We also assist companies in authorizing unlimited employment with U.S. residence for foreign nationals and obtaining immigrant visas. Omar has to be one of the best lawyers in the world, and his team is just as great! He deserves so much more than we can pay him! National, State, and Local Immigration Policies are constantly changing! 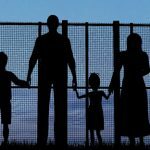 Immigration Attorney Omar Salguero's Blog Is A Great Place To Stay Up To Date. 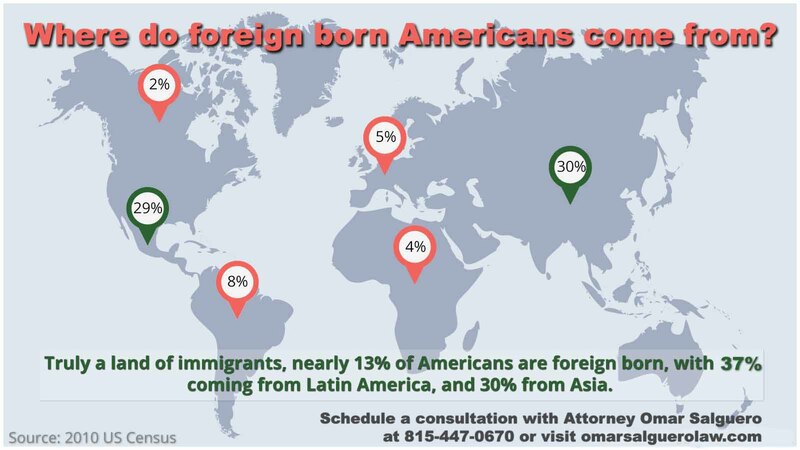 Where Do Foreign Born Americans Come From? 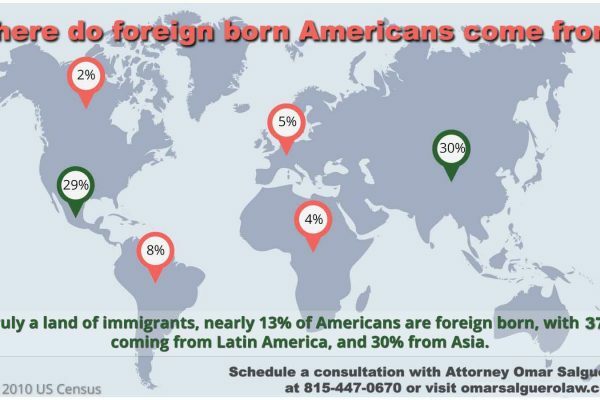 Omar A. Salguero is an Immigration law firm with offices located in Rockford, DeKalb, and Aurora, Illinois. We represent clients throughout Winnebago County, Boone County, Ogle County, Stephenson County, Cook County, Dupage County, Kendall County, Kane County, Dekalb County, McHenry County including the communities of Rockford, Belvidere, Loves Park, Rochelle, Roscoe, DeKalb, Machesney Park, Poplar Grove, Rockton, Byron, Cherry Valley, Pecatonica, Freeport, South Beloit, Marengo, Woodstock, Elgin Chicago, Naperville Geneva West Chicago and Crystal Lake. Our bilingual staff is ready to assist you! Please use the form below to get in touch with us! These are useful links you can use for your convenience. These are useful links you can use for you convenience.